Welcome to ACADIA GOLDEN RETRIEVERS, located on 24 acres in rural Lee County, North Carolina, about one hour southwest of Raleigh - home to quality, AKC European, "English" style Golden Retrievers and European / American style blends. Over the years we have participated in AKC, UKC, IABCA, and NCA shows in conformation, field and obedience training, and dock diving with our Goldens. 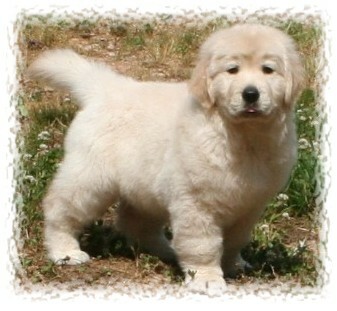 I am a Golden Retriever hobby breeder, dedicated to focusing on health, temperament, trainability and type, with the goal of producing multi purpose Golden Retriever puppies that conform to the breed standard, but first and foremost, puppies that are well adjusted, loving family companions. Our beautiful Afghan Hounds, now all at the bridge, except for our young girl Lyra, who has recently entered the show ring, have competed in AKC, UKC, and NCA, obtaining conformation championships. who has decided to use the name "Acadia". Summary for search engines: Golden Retriever dog breeders in Raleigh, North Carolina (NC) offering quality English Golden Retriever puppies and English/American blends. Beware of breeders advertising the following at excessively high prices: White Golden Retriever Puppies, English Golden Retriever Puppies, English Cream Golden Retrievers, English Cream Goldens, English Golden Retrievers puppies for sale, White Golden Retrievers puppies for sale, and White English Golden Retrievers. .
Did you know that Golden Retriever is one of the most commonly misspelled and misnamed dog breeds? There is only one breed - they are all Golden Retrievers! Misspellings and misnomers for Golden Retriever include English Cream Golden Retrivers, English Cream Golden Retreiver, White Golden Retreivers, English Golden Retreiver, English Cream puppies, English Cream retreiver, English Cream retrievers, English Cream for sale, English Cream golden, White Golden Retriver, White Golden Retrevier, White Golden Retriever pupies, English Golden Retrievers puppies, English Cream retriever puppy and English Cream Golden Retriver. Do not copy photos or any other content without written permission.